Michael Fassbender gives a really effective performance. His character is by far one of the most intriguing ones to watch on the screen. He does an excellent job of displaying a wide range of emotions within his role that helps you gain insight into his character’s motivations. Along with Fassbender, Katherine Waterston continues the responsibility of being a strong feminine lead in the footsteps of Sigourney Weaver. I think I was probably the most impressed by Danny McBride's performance. If you're familiar with his comedic style, it'll be really refreshing to see him show a much deeper side when he's placed in difficult situations. I really liked how there were a lot of religious themes throughout the film. There's a sense of tension between both logic/reason and faith. Without giving anything away, the religious themes play heavily in some characters. They really inform you as to the mental state of certain characters and their motivations. The Xenomorph aliens are back and better than ever! These aliens were faster, stronger and so much more terrifying. They bring back the sense of horror that Alien (1979) brought to the table so long ago. Besides that, Alien Covenant does not shy away from the body gore that has made the film franchise so memorable. If you have a weak stomach then you will want to bring a vomit bag or something. Things are popping out of people, body parts flying around, and blood…lots of blood. The pacing is a little long and unnecessary. Unlike in Prometheus where the slower pacing was necessary to help build the upcoming movie franchise, Covenant doesn’t need to follow suit in the same way. It was nice to see more dedication in building the mythology, but a lot of scenes, especially with the expendable crew, could’ve been cut. Speaking of the crew, THEY WERE SO STUPID! It was almost like they were allergic to common sense. They created so many of their own problems that it's really hard to even care about them at all. Unfortunately, I have to lay that blame on the writing and directing. The characters and their dreadful situations were just really poor setups. I believe that in order to have an effective horror, you can't show us (the audience) something that we would say, “Why did you do that? !” We should see the characters doing things that we would do. That would help us relate much more with them and their state of terror. We should be able to feel sorry for them. Lastly, the story itself is rather predictable. Full disclosure: I did end up watching a lot of the Prologue videos that 20th Century Fox has released. Unfortunately, if you pay a lot of attention to films the way I do, you'll put the pieces together really quickly. So for me (and maybe you) you may see the big reveals and plot twists coming from a mile away. I should also mention that I was really disappointed that we didn't get to see or learn too much about the Engineers either. While Prometheus teased us greatly into who/what they were, Covenant failed to deliver anything of substance to give us more information about them. Alien Covenant is like Prometheus 1.5. If you didn’t know, Covenant is a direct sequel to Prometheus. If you're still confused about what order you should watch the movies in, watch my video below about "Everything You Need To Know Before Watching Alien Covenant". Director Ridley Scott has previously announced that he had four more sequels to add on to this current Alien franchise. He then dialed back on that announcement and said maybe two more or so. Either way, don’t expect Covenant to answer all the burning questions you may have had in Prometheus. If anything, Covenant may raise new questions. Alien: Covenant is definitely worth the watch in theaters. 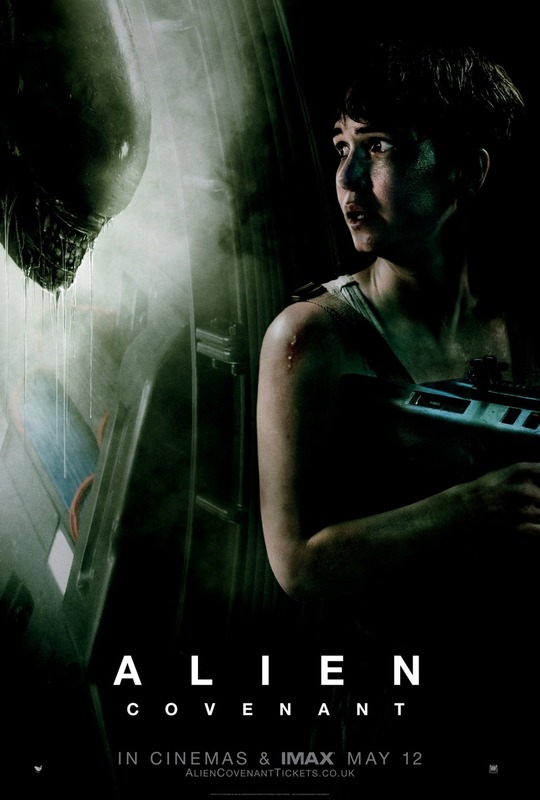 If you’ve been a fan of the franchise then you’ll probably like the fact that Covenant draws from a lot of the things that you may have enjoyed with the previous Alien movies. One thing that I found interesting about this film was how it wasn't entirely about King Arthur himself. While Arthur is obviously a main character in the film, he's almost like a co-star to the sword itself. It was nice to see more of the origin of the sword, and the literal power that it possessed. If you're a fan of anime cartoons, then you will easily see the similarities this movie adapts when it comes to the power the sword gives to the wielder. Charlie Hunnam was clearly in a role that catered to a lot of his strengths. He could be witty, charming, inspirational and physical in the action scenes. Eric Bana was a personal favorite of mine. I can't exactly put my finger on it, but I just felt he played his part so well that he's probably one of the few characters you may actually connect with despite his smaller role. Another aspect of the film that I enjoyed was the notion of sacrifice. It was a theme that gets played in a number of ways with various characters. In particular, I loved how it was used with Jude Law's character. It added a level of depth to his character that makes him a more complex villain in the movie. The movie has a lot of long and slow pacing parts. The film is about 2hrs and 6mins but it really felt like 2.5 hrs. The dialogue and banter contributes to this greatly. Furthermore, the story in itself is rather predictable. While this is a fresher and probably more original take on the story of King Arthur, you can see the intentional twist and turns coming from a mile away. I can't help but to think that maybe the combination of the thicker English accents and dialogue were a bit of an issue. There's a lot of dialogue used to tell the story (or hypothetical situations) and it can maybe get a little confusing mixed with the constant camera visuals switching back and forth. When you think of King Arthur and the sword Excalibur the one other character that typically gets associated is Merlin the wizard. I was really disappointed in the fact that they only mentioned him by name and briefly showed him on screen. It would almost be as if one were to watch the Lord of the Rings and only hear mentions of a wizard named Gandalf. I think that was a missed opportunity to highlight one of the central characters to the legendary story. When it came to Jude Law's character, he felt like one of the bigger disappointments. His character felt poorly developed despite the fact that his character had a lot of potential to be really deep. We don't get to necessarily see what motivates him to do the things that he does outside of just a generic reason like "I want power" or something to that degree. It's hard to really tell why he chooses to do the things that he does, and to some degree you just stop caring and go along with it. This film had a lot of potential to be much better than it was. 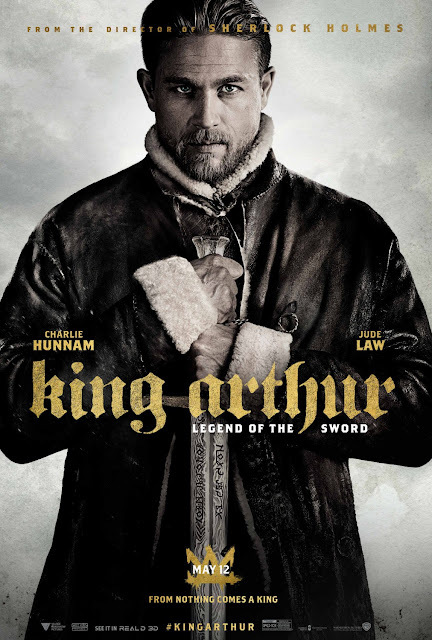 As an admirer of the King Arthur tale, I really wanted to like this movie. I don't terribly dislike it. It just feels like it'll be forgettable in about a week or so. I completely disagree with the reviews who claim that this movie is "trash" because we've seen far worse movies than this. This is a Guy Ritchie film. He's the same guy that brought you the Sherlock Holmes films with Robert Downey Jr. (Which I loved) and Man from U.N.C.L.E. (which was okay). He's got a very distinct style to his movies. As with any distinctive art, you will either hate it or love it. For me, this movie wasn't one of his strongest films. While King Arthur: Legend of the Sword may not be something you have to rush to the movie theaters to see, I can still see some appeal in it. If you're a Charlie Hunnam fan, then this will be watchable for you. Given the number of Game of Thrones characters in the film this movie felt like Game of Thrones + Assassin's Creed. You can most definitely wait on seeing this film. From the very beginning of the movie, you can immediately tell that the 3D visuals instantly pop out. The visuals of the film do not disappoint. The vast array of colors were vibrant and amazing to see on the big screen. The humor is, without question, the biggest highlight of this movie. You can tell compared to the first Guardians film that they clearly wanted to push more comedy this time around. It definitely embraced more of that "Marvel fun" that Marvel has been known for. This may be one of Marvels most comedic films because of that. However, despite the comedy, Guardians 2 was also able to find a nice balance with its dramatic moments. I would probably have to say that this is also Marvel's most emotionally driven film to date. It was like everyone got their own dose of Dr. Phil therapy and confessional moments. They did a nice job of handling the various daddy issues among the characters. Beyond that, each character in the movie is very well developed. I really liked what they did with Yondu, played by Michael Rooker. We also got some great scenes for Rocket Raccoon since he was given ample time to shine. Baby Groot was cute too. That's about it in Groot's regard. When it comes to the plot, I liked the twist in the film. It's minor, but I still enjoyed the implications it had on the motivations of certain characters. (Check my spoiler review video for more details.) I also really liked the potential setups that the end credit scenes hint at. Without getting into any specifics, I'll just say that it was very fun to see all the many special guest cameos throughout the film. I guess my biggest issue (nitpicking alert) is what they did with Drax's character. In this film, Drax is made out to be more humorous, and in a very different way than he was portrayed before. I'm not a fan of it only because, to me, it kind of appears as though he's losing his edge. Another issue was the language. This film gives off the appearance that it’s family friendly with the really fun vibe that it emits. However, it’s full of adult language like the “S" word, “B" words and "A" words. Not only that, but there's a lot of death in the movie too. It’s not graphic or anything like that, but the movie is a hard PG-13. I guess it's just not something I’d bring my 9 year old to go see. Guardians of the Galaxy Vol 2 almost felt like watching the Marvel version of Men in Black. It could probably be considered as the Deadpool of the MCU. The film pokes fun at itself without breaking the 4th wall. (Cue the superhero landings.) 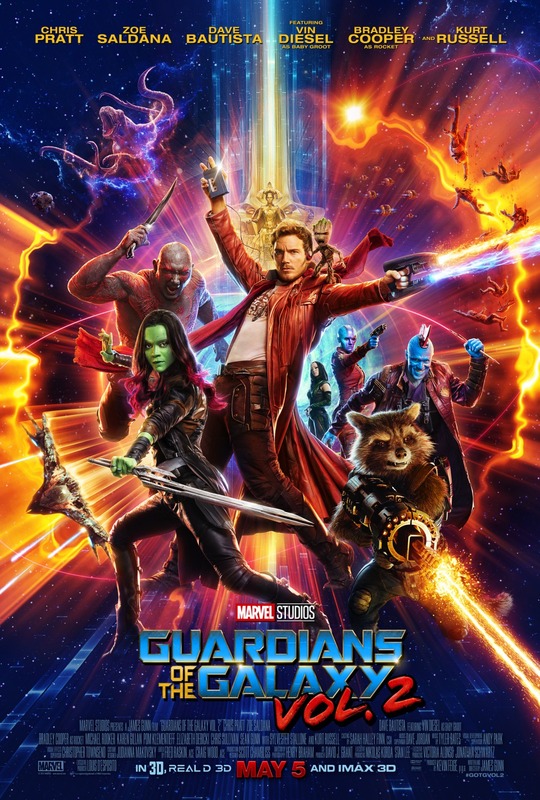 Personally, if I had to compare both Guardian films, I’d say the first Guardians was still better. What's important to take from that is simply that both movies are just different films. While the first Guardians would probably be considered as a Sci-Fi, Action, Adventure, Vol 2 is like a Sci-Fi, drama, comedy. So it really just comes down to your personal presence of genre. Hopefully by now you don't need me to tell you, but you should definitely stay for the end credit scenes. There are FIVE of them all the way until very end. As I mentioned before, the 3D is totally worth it, so go check it out as soon as you can.